Marlen Stahlhuthor Leniis a multi-media artist currently living in Berlin. Her schedule is bustling with creative projects, working as a fashion editor & photographer, and also freelancing for big venues like MTV and Vice, while also managing her personal livestyle blog Paperboats. 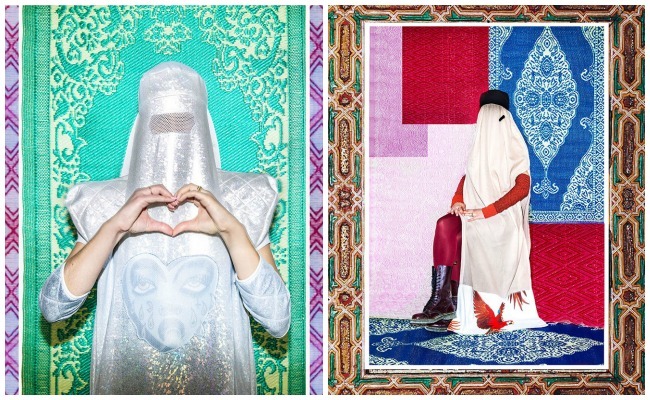 Her work is colourful, unusual, and sometimes verges on controversialshe caught our eye with her recent photography project in BLONDE Magazine, called Burka is the New Punk. For this series, Berlin fashion designers created their own burkas and Marlen was commissioned to photograph them. The images are bright and intricately detailed; rich with patterns and different layers of fabric. In this interview, Marlen gives us insight into the process and challenges she faced in preparing Burka is the New Punk. Lola Who: Hi Marlen! Can you please tell us a little bit about yourself, your background, and how you got started with photography and fashion? Marlen: Hey there, everyone mainly calls me Leni! I’ve been living in Berlin for about three to four years now (coming from Hamburg), and I work as a photographer and blogger. I never really planned for any of this to happen but rather slipped into the whole thing. I studied fashion journalism at the AMD University and basically started blogging in order not to have to call my mom every day! She had a hard time with the first child moving out! All of the sudden, people offered me money in for street-style photos I took and published on the blog, and then things just kept going. The street style thing definitely got things going, and I still like to shoot them but only if Im interested in the person, I hate the paparazzi mentality that street styles bring in our days. Lola Who: Can you tell us a bit about your project Burka is the New Punk? Where did the idea come from, and what did it mean for you to be involved with it? Marlen: Im very much into documentary photography. After a while fashion becomes a little dull. The only problem is that fashion photography pays rather well, while documentary doesnt. So I try to mix them whenever I can, and some magazines/brands are awesome and brave enough to take that risk. The idea actually came from Blonde magazine, while I was talking to the editors who have now become close friends. I loved the idea, taking a different approach to the topic, especially after it was only weeks after the horrible Je suis Charlie events. I knew it would be a controversial thing, but I would rather shoot something controversial that gets people thinking, than shooting something youve already seen. Lola Who: Can you describe the process of setting up the photos for this shoot? Each picture has intricate details, patterns, and colours  were they planned very carefully, or was there an element of spontaneity? Thats the look I tried to go for. Lola Who: In your view, what is punk and how did the burka suddenly become punk? Not all Muslim women are forced to wear Burkas. Of course not! And looking at simply the cut and design of the garment, its a beautiful piece of clothing. At some point in history, uniforms and even women wearing pants were seen as disturbing to some. Lola Who: Punk subculture is strongly associated with anti-establishment views, freedom of expression and a dose of aggressiveness. From your point of view, in what ways might women who wear the burka share similar ideologies? Marlen: I cant speak for them, and I dont want to. I have a lot of friends that hide their hair and silhouette because it feels good to them and I understand that. Everyone should be able to wear what they want as long as they dont force other people to do it as well, and dont harm anyone by doing it. Besides, I think the biggest contribution to punk is not the way people dressed but the ideas they were fighting for. or the ideology they were chasing. You can do that wearing whatever. Lola Who: What kind of response has Burka is the New Punk been getting, and what do you want your viewers to take away from it? But neither of those comments are the reason why we shot this. All what I ask for is for people to started thinking about the topic, and to start discussing it. There is never a right or wrong. Its all about perspectives. Lola Who: What is the biggest challenge that you faced in developing this project? Marlen: I knew far to less about burkas, the culture and history behind it. So I enjoyed getting different insights on the topic and talking to different people with very different opinions. Theres always so much more you can learn, and it makes you a more tolerant person. Just because you dont know it, doesnt mean you have to be afraid of it, but sadly thats what I see happening a lot. Lola Who: Where do you find inspiration for your photography? Can you describe for us a real-life situation that has inspired you to continue? Marlen: I spend 24/7 of my time on the internet. Literally. Tumblr, Pinterest, Instagram… There is so much creativity out there that gets you inspired its crazy. Discovering a new Instagram account that I like will really get my brain running. I also watch almost one movie a day while editing photos. Especially movies from the 80s and 90sI have a momentary crush on those! Its also about the people you meet. If I think they’re beyond cool, and they like what I do, that means the most to me. Lola Who: After Burka is the New Punk, is there something that you are currently working on, or are excited, that you can tell us about? I find it absolutely fascinating. The possibilities are endless and obviously also of personal interest. I hope this will turn out to be a book or an exhibition one day. Simply because of all the great people I met. Follow Marlen on Twitter and Facebook and check out her Paperboats project.